Today, essentially all industry sectors are developing and applying “big data analytics” to gain new business insights and new operational efficiencies. Essentially two forms of analytics processing support these business-targeted applications: (i) “analytics explorations” that search for business-relevant insights in support of description, prediction, and prescription; and (ii) “analytics flows” that are deployed and executed repeatedly to apply such insights to support reporting and enhance existing business processes. The human environment that surrounds business-targeted analytics involves a multitude of stake-holder roles, and a number of distinct processes are required for the development, deployment, maintanence, and governance of these analytics. 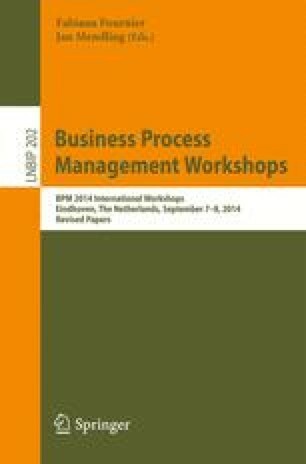 This short paper presents preliminary work on a framework for Analytics Process Management (APM), a new branch of Business Process Management (BPM) that is intended to address the central challenges managing analytics flows at scale. APM is focused on the processes that manage the overall lifecycle of analytics flows and their executions, and their integration into “operational” business processes that have been the traditional domain of BPM. The paper identifies key meta-data that should be maintained for analytics flows and their executions, and identifies the core business processes that are needed to create, apply, compare, and maintain such flows. The paper also raises key research questions that need to be addressed in the emerging area of APM. The perspective described here developed through discussions and projects with many people, including: Matt Callery, Richard Goodwin, Elham Kabhiri, Mark Linehan, Pietro Mazzoleni, Danny Oppenheim, Krishna Ratakondra, Jeff Robinson, Anshul Sheopuri, Piwadee (Noi) Sukaviriya, Roman Vaculín, Chitra Venkatramani, and Dashun Wang.